A couple of weeks ago and I came across an interesting HTML5 based experiment. Canvas based image manipulation by Patrick H. Lauke. 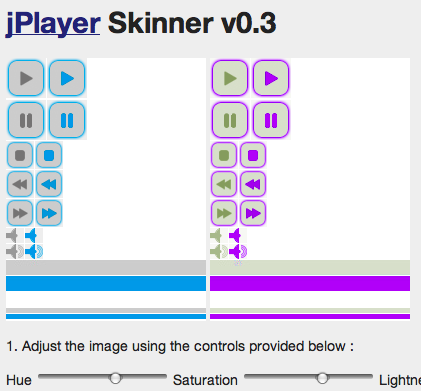 Thinking this could be quite useful if we could save the resulting image, I cobbled it together with Jacob Seidelin’s Canvas2Image and suddenly I had a working prototype of a jPlayer Skinner. If we were to try and create something similar without using HTML5 we would have needed either to use Flash or manipulate the image on the server. (Let’s just pretend Flash doesn’t exist for the purposes of this post). Even if you put to one side the added complexity of creating and integrating the serverside code, it makes much more sense to do this kind of manipulation clientside – the load is perfectly distributed, in fact all the server has to think about is serving up plain old text. This is a huge win for HTML5 and one that not many people are talking about. Increasingly we are using client’s CPUs as the workhorse for complex activities that previously could only be achieved on the server. This means more efficent web apps, less traffic between client and server and fewer cycles being consumed on the server. In short HTML5 helps web apps scale.